In connection with his release from prison, which resulted from his writing The Shortest-way with the Dissenters, Daniel Defoe began acting as a spy for the English government. The goal of Defoe’s espionage was to advance the Acts of Union, which would unite the governments of England and Scotland under a single parliament. While the two British nations had shared a single monarch since the 1603 ascension of King James I, their governing bodies remained separate. The first edition of this work was published in 1709, just two years after the 1707 Acts of Union, and sought to explain the long and interconnected political history between England and Scotland, dating back to the first attempt at union by James I. 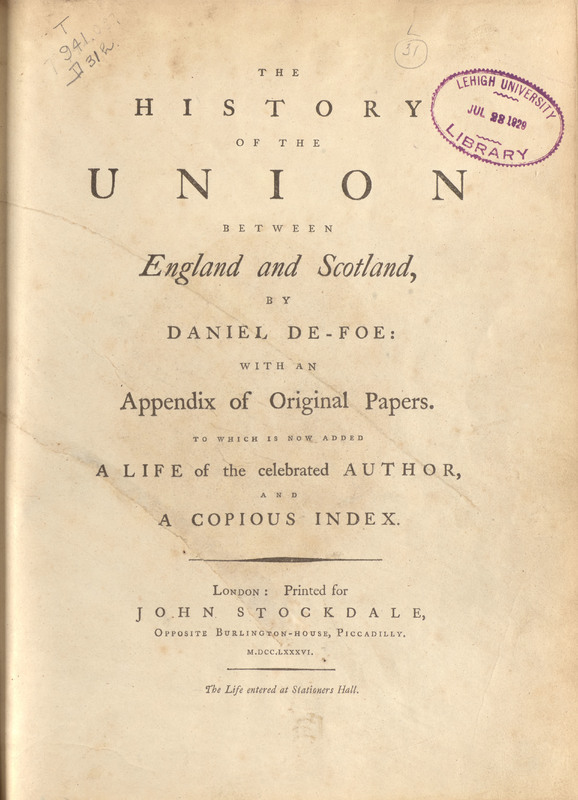 The History of the Union Between England and Scotland, with a Collection of Original Papers Relating Thereto. London: J. Stockdale, 1786.